Good afternoon. Family, friends, colleagues, and distinguished guests: It is a pleasure to be here with you this afternoon. Most of all, it is a pleasure to help celebrate the Tufts Class of 2018. Graduation from Tufts is a milestone for all who are close to our students. A college career can bring with it unforeseen challenges as well as hoped-for triumphs. Those who love and care for our graduates have provided them with support and encouragement all along the way, rejoicing in good times and offering a steadying hand when things got rough. As we begin, I would like to ask the graduates to stand and recognize the support… care… love… and sacrifice… of the parents… grandparents… siblings… partners… children… and friends, who have made this day possible. Seniors, please give them a hearty round of applause. All of you shared a portion of this journey and supported our graduates. We are grateful to you for entrusting these young people to be educated at Tufts, and for helping them thrive while they were here. I would also like to recognize the devotion and excellence of Tufts’ faculty, deans, coaches, and staff. In countless ways visible and invisible, academic and personal, they have supported and guided our students. It is a privilege to share the stage with their representatives. I am also grateful to the students who have enriched our campus and this day with the important messages of their faiths, traditions, and philosophical perspectives. And to the Reverend Greg McGonigle and his colleagues in the University Chaplaincy for organizing this afternoon’s celebration. Finally, thank you, Anna, for that thoughtful Wendell Phillips address. You are an outstanding representative of the Class of 2018, and your address was all that I could have expected from someone who exemplifies the very best of Tufts. Members of the Class of 2018: This Baccalaureate service is the last time you will gather together as a class. In the years since we first gathered for your Matriculation in August of 2014, you have gone on to excel in your chosen pursuits with passion and creativity. The outstanding students who received this year’s Academic Awards, Presidential Awards for Civic Life, and Alumni Association Senior Awards reflect how exceptional your accomplishments have been. I have watched you act in extraordinary plays, and sing, dance, and perform with passion and brilliance. You have participated in national arts competitions ranging from dance to slam poetry. Over the last four years here, the university’s athletics teams have won many NESCAC championships and participated in multiple NCAA championships, winning an impressive number of them. During your time on the Hill, our campus has changed—we’ve welcomed our new Jumbo, honored our very own trailblazer Bernard Harleston with the dedication of Harleston Hall, and opened CLIC and the state-of-the art Science and Engineering Complex. But perhaps the most remarkable physical transformation on our campus occurred during your first year when you survived the record-breaking winter of 2014-15. Fortunately, the snow piles were not permanent—though they may have felt like it at the time! You have not been just onlookers to developments on campus. Far from it. You have worked for social justice and against racism… supported undocumented and international students…and requested changes in university policy. As leaders, you’ve initiated programs such as “Swipe It Forward.” You have been tireless advocates on campus, in our local communities, and around the world. Tomorrow, you will join the more than 110,000 members of our alumni community representing Tufts around the globe. I hope that you will cherish the friendships you have made here, keep in touch with your advisors and mentors, and stay connected with the university. I know that your careers and accomplishments throughout your lifetime will give us cause for pride. You leave Tufts to enter a world that is evolving every day. Success and satisfaction in a changing environment call for flexibility. I hope that you will look forward to the future with an open mind and embrace it with the same enthusiasm and passion that you brought with you to Tufts. This is not just a question of adapting to circumstances: You can never know when an experience or interaction will unlock new opportunities by encouraging you to move in an unanticipated direction. When I was not much older than you, as a graduate student, I heard a talk by a young faculty member that inspired me—quite unexpectedly—to switch my graduate research from neuroscience to human genetics. That was a huge risk for me personally, but it turned out to be absolutely the right decision. The work led to the discovery of the first gene for a human inherited disorder based solely on a genetic approach. And last fall, some thirty years after I started that research, the FDA approved a new therapeutic treatment based on what we had learned— the first drug ever to treat Duchenne Muscular Dystrophy. I followed my gut instinct about accepting a challenge, and taking that leap had an impact I could not have imagined. So I encourage you to be open about your chosen path. College is famously a time for intellectual and personal exploration. But the process of intellectual and personal exploration should never end with college. Even if you have a careful plan in mind now, be open to revising it when an opportunity to make a difference comes along. Those opportunities to make a difference in a new way won’t end at 30 years old. They will come along later in life too. Again, be open to them. About a dozen years ago, after many years as a researcher, faculty member, and center director, I had the opportunity to join the central administration at my then-university. I found that I enjoyed the chance to work with colleagues from disciplines I did not know well, to bring together diverse constituencies in a common interest—and ultimately, to make a difference on a bigger scale. 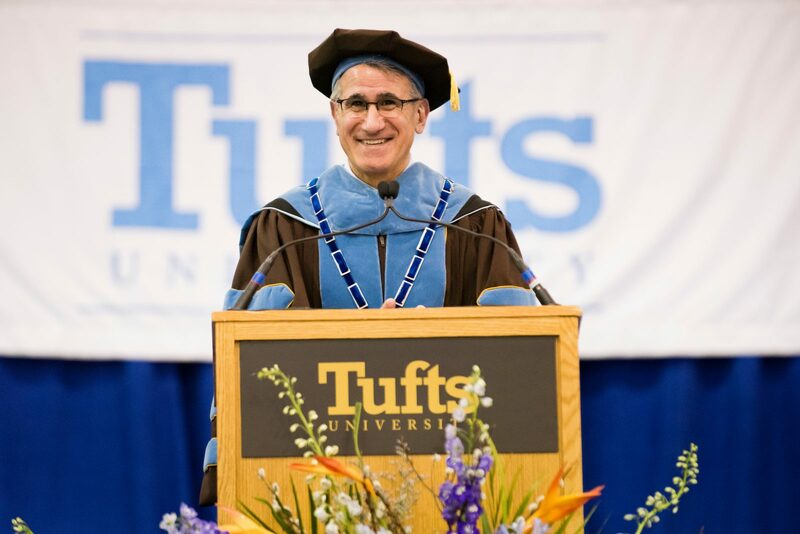 That work eventually led me here to Tufts, to the unique opportunity to work with outstanding students, faculty, and staff to make a great institution even stronger. In my work, I draw on everything I’ve learned over the course of my career, but in a way that I never consciously planned for or aimed at. Fortunately, you leave the Hill tomorrow with the capacity to take advantage of the wonderful opportunities that will present themselves to you. During your time at Tufts, you have gained compelling long-term skills—skills such as critical thinking, complex problem solving, written and verbal communication, and habits of minds that enable the questioning of established thought and social assumptions. These are skills that will stand the test of time and serve you and society well both today and tomorrow. And they are the same skills that employers currently say they prize most highly in employees. During your time on the Hill, you have acquired these invaluable skills through transformative learning experiences ranging from rigorous course work, study aboard, and independent research and scholarship to energetic participation in athletics, leadership in campus activities, and service in the community. All of those experiences have strengthened your resilience, enhancing your ability to be flexible and succeed in a changing environment. These are skills that will help you navigate transitions presently and into the future. Looking ahead, we also need educated individuals who are willing to take on causes larger than their own self-interest. Active citizenship is critical to creating and maintaining an innovative workforce, a vibrant culture, and a robust civil society. In its most simple form, it means educating future leaders for positive change. As students, you have demonstrated a commitment to active citizenship through your advocacy and your service to organizations and communities close to campus and around the world. You have proven that you’re willing to take on causes selflessly; as graduates, many of you are drawn to mission-oriented roles that are vital to thriving communities and advancing society. No matter what career path you follow, I hope that you will put your values, knowledge, and skills to work for the greater good. As Jumbos, it is in your DNA to break molds, to lean in, and make change. The world is facing great changes and challenges: from global warming and continuing economic transformation to political instability and conflict in regions around the globe. Tufts is engaged in all these areas, and many of you will be too as you begin your careers or continue your studies. The complex and intertwined challenges we face require solutions that go beyond individual areas of study, public policy or industry. If we are to work together to find innovative solutions to the big problems facing our society, it will require excellence and depth in our disciplines, active listening, recognition of differences, and finding common goals. We believe that your Tufts education has prepared you to follow your passions and to tackle the challenges of our times. And that is exactly what we expect you to do. I hope that your experience at Tufts has been indeed a source of light. I believe we need that light now more than ever in the face of the complex challenges our world faces. So I challenge you, the Class of 2018, to make that light shine even brighter in the 21st century. Congratulations, Tufts Class of 2018!